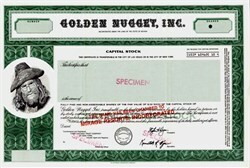 Beautifully engraved RARE Specimen certificate from the Golden Nugget, Inc. in 1988. This historic document was printed by Jefferies Bank Note and has an ornate border around it with a with a vignette of a pirate. This item has the printed signatures of the Company’s President, Stephen A. Wynn and Secretary and is over 22 years old. Opened as a gambling hall in 1946, the Golden Nugget Las Vegas has 1,907 guest rooms and suites; 38,000 square feet of gaming space including 1,300 slots and 50 gaming tables, and 29,000 square feet of meeting and banquet space. Golden Nugget, Inc. was acquired by Mirage Resorts and changed its name in 1991. Mirage Resorts, Incorporated is a leading owner, developer and operator of casino-based resorts. Mirage owns and operates five casinos in Nevada: the Bellagio, Mirage, Treasure Island, Golden Nugget - Las Vegas, Golden Nugget - Laughlin, and the Beau Rivage casino in Biloxi, Mississippi. Mirage also owns the Holiday Inn Casino Boardwalk and has a 50% interest in the Monte Carlo Resort & Casino. On March 6, 2000 MGM Grand, Inc. and Mirage Resorts, Incorporated announced that their respective Boards of Directors have approved a definitive merger agreement, under which MGM Grand will acquire all of the outstanding shares of Mirage Resorts for $21 per share in cash. The transaction will have a total equity value of approximately $4.4 billion. In addition, MGM Grand will assume the outstanding debt of Mirage Resorts of approximately $2.0 billion. The deal closed on May 31, 2000 and Mirage Resorts was no longer traded as a separate company.